Your journey takes you through a series of caves, each filled with fascinating discoveries. Learn where the Maya worshiped, sacrificed, and got their sacred water from. This adventure is filled with much humor and excitement as much as it is refreshing. 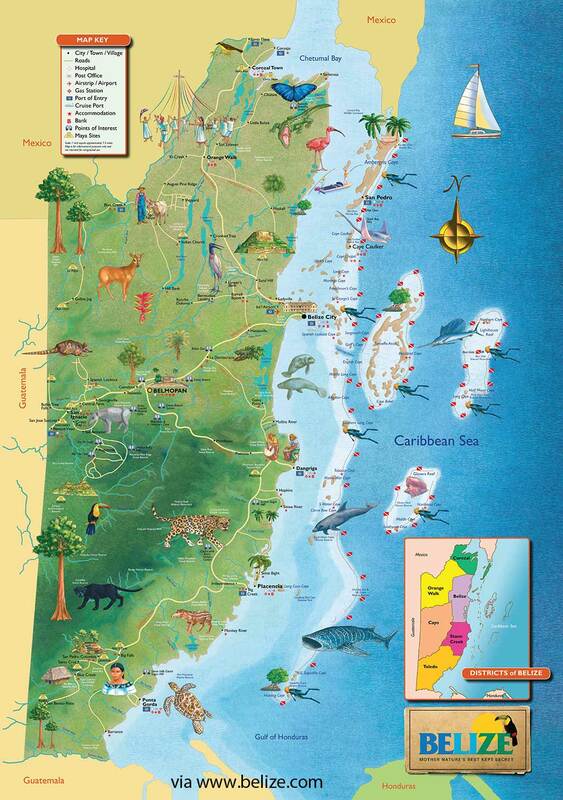 Come experience this beautiful unexposed JEWEL of BELIZE with us! Your day starts at 9:00 AM with a 1.5-hour drive to the site. At the park, you grab an inner tube, then embark on a 45 minutes hike across the clear blue Caves Branch River and along a trail heading upstream alongside the river. Your guide will point out interesting aspects of the local flora&fauna – the perfect time to take out your cameras! Upon arrival at the designated starting point, your guide will brief you on the proper safety techniques for boarding & floating on your tube. If you’re adventurous, you’ll want to dive or splash into the water from a rock at the starting point. 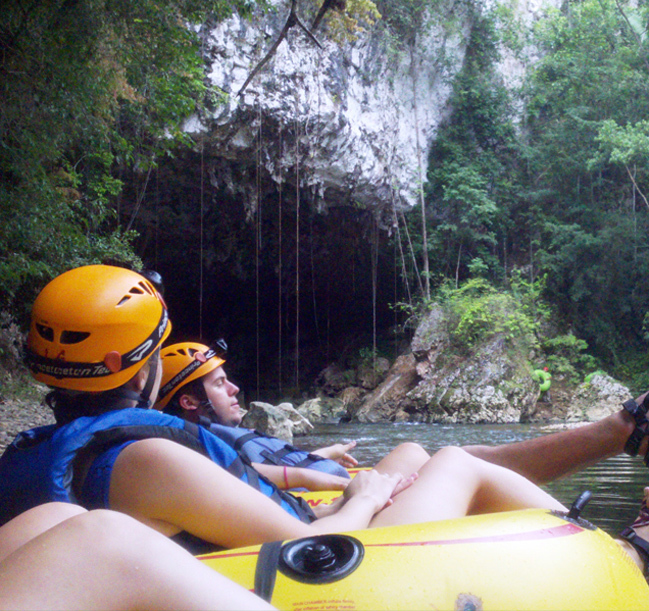 You’ll set yourself afloat through a series of cavers which periodically open up to the sunshine & jungle. Your guide will occasionally point out various Maya artifacts. You may unboard your tube & walk up for a closer look if you wish. What to Bring: Water Shoes, Shorts, Lightweight T-shirt, change of clothes, Towels, Sunscreen, Hats, Water, Insect Repellant, Camera. Included: Lunch, soda, water, helmet with headlamp, inner tube, Life Jackets are provided for non-swimmers. Note: This adventure may be done as a full day trip on its own or in combination with Ziplining, Xunantunich Ruin or the Belize Zoo. Zip lining is an exhilarating, adrenaline-pumping activity that is safe for the entire family. 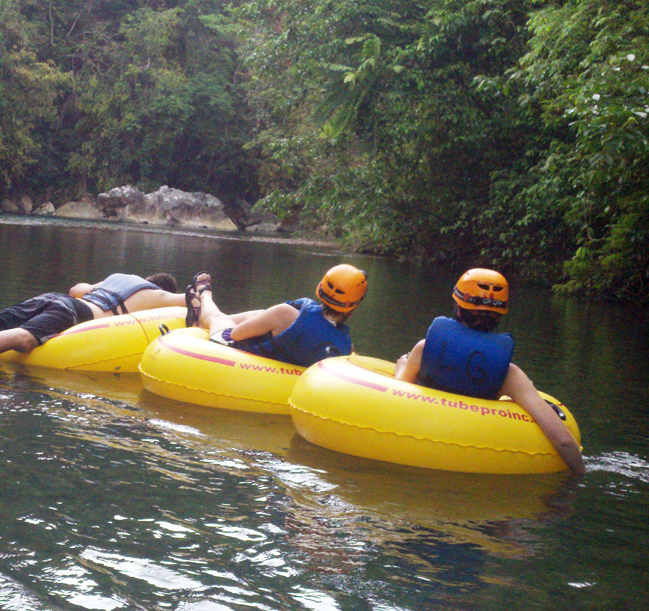 Located along the banks of the Caves Branch River, Jaguar Paw provides the best Zip Line in Eastern Belize. Enjoy a birds-eye view while “flying” over the river and trees. Jaguar Paw Belize provides expert guides to secure your gears and ensure a safe adventure. After a 10-minute nature walk to the main platform, your guides will fit you in a harness and secure you to the main cable. You will also wear a helmet and gloves for extra safety and comfort. A guide will be waiting at every station to assist in landing and taking off. Belize Zip Line also includes a short trail to higher stations hiking under towering cohune trees. Some lines are longer than others- leading up to 700 feet across the jungle. The entire tour takes about 45-60 minutes. Since Zip lining is a half-day tour, shuttles depart either early in the morning or midafternoon. 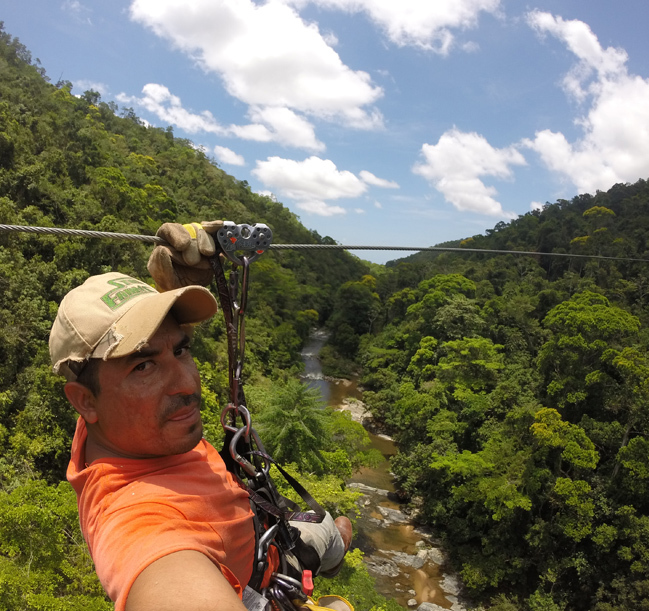 Zip lining is the most exciting day tour in Belize. It is as close as you can get to flying, and Jaguar Paw Belize makes it possible. Belize Jungle Masters -:- Email: belizejunglemasters@gmail.com -:- Cell: 011 501 660-5656 -:- St. Matthews Village, Mile 37 Western Highway, Cayo District, Belize C.A.